An article posted 11-15-2018 discusses a re-analysis of one of the largest organisms on earth. Armillaria gallica, first studied by James B. Anderson in 1992, was re analyzed 26 years later ( which is not nearly 30 that’s 4 years off, closer to 25 years really) by Anderson to discover that instead of a 1,500 years old and 100,000Kg fungi that spans 37 acres this single individual is actually closer to 2,500 years old 400,000Kg, and spanning 173 acres in a forest in northern Michigan. Fungi, if you remember your intro mycology class and not your 4th grade science class because no one remembers 4th grade science, if they even learned about fungi in 4th grade, have to feed off of other organisms, living or dead, to get their sustenance. 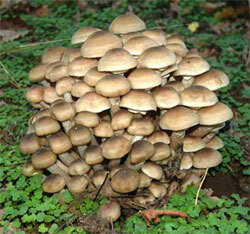 A. gallica is a facultative plant parasitic fungi feeding on the roots of the forest trees and decaying plant tissue. In Anderson’s study he goes into much more detail about how he went about testing that this was a single individual, and all of the genetic testing. The news article doesn’t go into very much information on the methods. It does mention that there seem to be a low amount of mutations within this fungi and how if we can understand this we can potentially use it in cancer research, but the paper goes into much deeper detail about the mechanisms of this. Finally the news article ends on a very sad note. Not only is this huge fungi not the largest fungi in the world, the largest fungi in the world is still smaller than the dying clonal aspen forest in Utah. It’s dying because of humans, of course.